Food insecurity refers to the USDA’s measure of lack of regular access to nutritional food for an active and healthy life. The food insecurity rate in Washington County is 12.8% of the total population, and the child food insecurity rate is 19.1%. Last year, Dare to Care distributed enough food to provide 459,167 meals to Washington County families in need. Of that, 217,000 pounds were fresh produce, which was distributed for free. A couple of months ago, 70-year-old Nancy felt an intense discomfort she had never felt before. She was hungry. Caring for her 94-year-old mother made it impossible for Nancy to hold down a full-time job, and between the two of them money for food was not available. About the same time, her sister experienced a painful divorce. And, after their first Thanksgiving without a meal, they both decided to seek the help of Dare to Care and the local food pantry in Campbellsburg, Indiana. “Sometimes there is just nothing you can do. You need food and I’m happy to get help here,” Nancy said. Nancy says the people are always nice and helpful, and the food is very good. In fact, the one thing that excited Nancy the most, in her last box of food, was a single head of lettuce. “I haven’t had a head of lettuce in so long. This is exciting. I can make so many things with this,” Nancy said. As she packed away her items, she was surprised by a gallon of orange juice, her favorite. 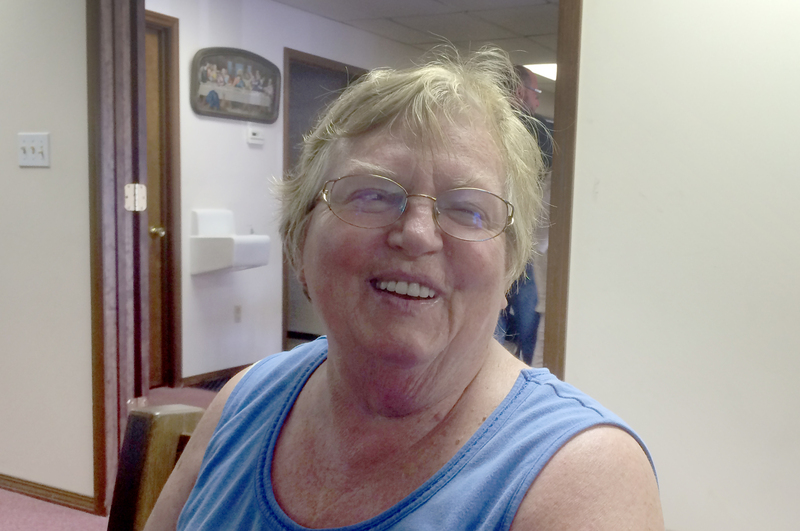 Nancy’s biggest hope is that Dare to Care will continue to provide services in Campbellsburg, so people like her don’t have to go hungry and continue to suffer without hope.